For home design enthusiasts, the book provides inspiration and brings poetry to the communal act of building. 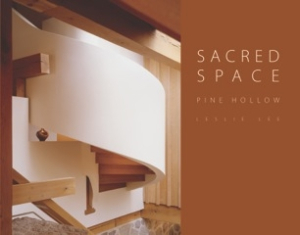 Sacred Space celebrates Pine Hollow, an expansive retreat inspired by the Lake Michigan shoreline. Leslie Lee, who founded the Pine Hollow Institute “to heal people and planet Earth,” pairs her own musings with architectural photographs in this splendidly designed coffee table book. She presents the estate as an exemplar of craftsmanship, and as a regional gift to nourish generations. Designed by architect Roger A. Hummel, the home is featured through peaceful landscapes, exterior shots, rooms furnished in Zen palettes, and artistic close-ups of beams and stairways that evoke airiness as well as solidity. Each photograph is accompanied on the facing page by lines from the author’s poem, “Sacred Space.” Ample white space and wide margins allow words to stand like stepping stones toward a meditative journey. The poem is thoughtfully replicated in its entirety at the end of the book. Sacred Space spans geologic time—from “glacial melt” to the more contemporary “toxic soup of atmosphere.” As the author guides readers through the surrounding environs and construction process, themes of connectedness, the potential residing within humanity, and hopes for the future emerge. With fewer elevated phrases, such as “the fundamental chord of this bequeathed refrain,” and abstractions that include “transcendent light within the windows of its soul,” among other examples, the work would more closely echo Pine Hollow’s natural beauty, which the author aptly describes as “worn with time, / bereft of ornament.” When the writing takes direct, tactile turns—“strength of oak, longevity of teak, cast brass / and hardened steel,” “the sweetgrass scented air,” “salted stone”—the poem gains firmer footing. On occasion, broad ideas diminish promising images, as when the graceful lines “What is a door but a threshold of mystery / to close against the storms, or open to the wind— / to bar the dragonflies of maps and compass box” continue a bit too long. Some lines also tend toward dense accumulation and hard rhythms: “Tectonic forces shifted surface crusts from one / or other latitude while greenery exhaled / enriching air for tiny creatures living there, / and larger ones that fed off reefs of coral beds / in equatorial oceans that flowed offshore.” Still, profound respect for the environment imbues the work with deeper consequence.